Region: This beetle is found in eastern United States and parts of Texas, Arizona, Colorado, and Utah. Similar species can be found throughout North America. Life cycle: One to three generations are produced each year. The adults hibernate in open fields, woods, garden rubbish, or weeds. It will return late in March in the South and in June in the northern United States. Two weeks latter, it deposits its yellow clusters of eggs on the undersides of leaves. Physical Description: This 1/4 inch, round insect is yellowish brown with 16 black spots on its wing covers. Its eggs are yellow and are laid in clusters on underside of leaves, while the spined, 1/3 inch long larva is orange. Feeding characteristics: This ravenous beetle feeds on leaves, pods and stems as both larvae and adult. It carries the reputation of being the number one enemy of vegetable gardeners in the east. The beetle will skeletonize leaves from underneath. It will eat any garden bean, but prefers the lima bean. Controls: The organic gardener's first line of defense is handpicking. Drop the beetle in a bucket of water. When harvest is over, clean your garden of all debris. This will reduce overwintering areas. Try planting your bean crop early, some success has been accomplished by this strategy. You can also interplant with potato, nasturtium, savory, and garlic. Some gardeners have even had success with a spray consisting of crushed turnips and corn oil. Alternatively, try a cedar spray, from boiled cedar chips in water. You can use Rotenone or pyrethrum for more serious infestations. This beetle does have predators. 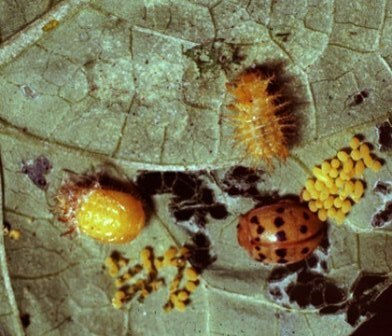 Some species of Lady Beetles will prey on the eggs on larvae. Another useful insect is the Spined Soldier Beetle, which will attack all life stages of the Mexican Bean Beetle. A bean beetle parasite, Pediobius foveolatus, is now on the market. The tiny wasp will lay its eggs in the beetle larvae. Several varieties of bean have been known to show signs of resistance. These beans are the Wade, Logan, and Black Valentine. Beans susceptible are the State, Bountiful, and Dwarf Horticultural varieties.